It's been a really great month! Tarragon: Key Keeper was successfully launched, with a great party through Loving The Book Launch. They did an awesome job! And with the blog tour. We saw some pretty awesome posts. I just wanted to take the time to let you know what is in the works. For those who didn't know, Tarragon is a three-part series. Book two, Dragon Mage, will be released in Spring of 2017. I'll give you more details as the time comes close. That's right, friends, contests. They're still in the works, but I thought I'd give you a head's up for some of the things we've got planned. I want to keep the fun going. For now, why don't you subscribe to my newsletter? Members of my newsletter receive an exclusive discount coupon for Tarragon: Key Keeper, ebook version. This coupon is good through Memorial Day via Smashwords, so don't wait too long! I only send out the newsletter twice a month, after all. Let's see, what else. 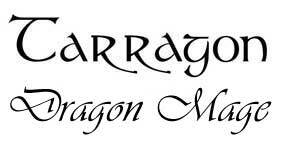 Fingers crossed, we will be setting up a website for the Tarragon series this summer. It all depends, of course, on how busy I get with editing book two, working on my radio drama, and my day job! But fingers are crossed.